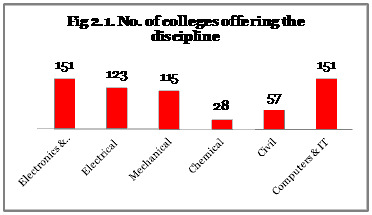 AICTE and CII undertook a survey of industry linkages of engineering institutes in an online mode between 7th June 2012 and 7th September 2012. There are six top corporate of India who are sponsoring the awards. A detailed analysis of the outcome of the survey including the level of linkages, regional spread of institutes which show high participation from industry, performance of institutes on the seven parameters—governance, curriculum, faculty, services to industry, infrastructure, entrepreneurship and placements—will be there in this report. As per UNESCO Science Report 2010, China has 70 million Science & Technology personnel of which 1.36 million are R&D personnel. In India we have 40 million Science & Technology personnel of which only 0.39 million are R&D personnel – less than 1/3rd that of China. In terms of density of R&D personnel per 10,000 labor force, China’s figure is twice that of India. In India less than 30 per cent of the total investment in R&D comes from the industry. So even while research output from academic perspective is increasing, from the application side there are still wide gaps. To address the problem of low industry investment in R&D, the Science Engineering and Research Board (SERB) of the Department of Science and Technology (DST) and the Confederation of Indian Industry (CII) have joined hands to take several focused actions. This includes a joint fellowship scheme for doctoral research which will be supported equally by SERB and CII. Industry and government will contribute in equal proportion to provide scholarships to PhD candidates who will do research on problems identified by industry. Every year 100 fellowships will be given. The first annual CII-PwC Report on Higher Education 2012 will be released. It will provide latest facts and figures on the sector and analyse the regulatory scenario. For the first time, CII will felicitate three distinguished personalities for their outstanding contribution to academia and industry. He has established DIRI – the Deakin India Research Initiative to provide Doctoral programs in India and then the Deakin – TERI Institute for Nano-Biotechnology in Delhi. The total investment commitment to India through the 2 initiatives is more than A$ 8 million. This is one of the largest commitment to India led by a single entity and has been led by Prof. Peter Hodgson from its inception. The Centre brings together a unique multidisciplinary team with excellence in nanomaterials and molecular bioscience from Deakin and a wealth of experience in biotechnology applications for agriculture, pharmacology and environment from TERI’s Biotechnology and Management of Bioresources Division (BMBD). Ms. Berlia plays a leading role in the Indian Pharmaceutical Industry and has been actively involved in taking up various important issues like drug norms and price regulations with the government. She has interests in the area of Life Science, Information technology, Distribution and Logistics and Education. Ms. Berlia is the Vice-President of the Apeejay Education Society which runs13 Schools and 16 institutions of Higher Learning in India with 40,000 students on their rolls. Ms. Berlia has been guiding the Apeejay higher institutions in developing Corporate Training programs, Management Development Programs, Industrial Consultancy & Research etc. She has also encouraged the Apeejay higher institutions to utilize the expertise and experience of their Senior Academicians in conducting Professional Programs for teachers of other institutions from all over the country. As part of her initiatives to promote research culture in the Apeejay institutions, she has helped to set up the first Innovation Centre of the Confederation of Industry in India (CII) under the CII TDBT NET programme. Mrs. Berlia has been at the forefront of pursuing reforms in higher, technical and professional education in the country. She plays a leading role in the formation of policy ideas and analysis of government reform, and her suggestions on inclusive education, industry-academia linkages and implement able solutions for funding of higher education have been well-appreciated by the government and the regulatory bodies. Mrs. Sushma Berlia has been nominated as the Board Member of the National Board of Accreditation (NBA) constituted by AICTE to develop a quality conscious system of Technical education where excellence, relevance to market needs and participation by all stake holders are prime determinants. Dr. M L Gulrajani is currently working as emeritus chair professor at the Department of Textile Technology, IIT Delhi. He has illustrious research experience involving textile chemical processing, dyeing and printing. He was a Dean of Industrial R&D, of IIT Delhi. He has undertaken more than 50 consultancy projects from textile industries, and guided students for PhD, M.Tech, and M.Sc degrees. Dr. Gulrajani has to his credit of having 150 research papers published, editing 24 books, having five Indian patents, and proceeding conferences. He has been titled as the ‘UDCT Diamond’ as a recognition of his proficiency. His first major industrial opportunity came in 1976 when he was approached by the Director of East India Cotton Mills for developing an alternate gum for printing of Reactive Dyes on cotton fabrics. He has been involved in the projects sponsored by Ministry of Nonconventional Sources of Energy on design and developments of Solar Energy based Kier for desizing. He was the Director R&D of Alps Industries Ltd and has conducted training programmes on ‘Computer Color Matching’ for Grasim Industries. He was the principal coordinator of the Technology Business Incubation Unit (TBIU) which was set up at IIT Delhi through FITT (Foundation for Innovation and Technology Transfer). There will be two special sessions where approach and strategy for development of state higher education systems and educational innovations at state level will be discussed. These two sessions will be spearheaded by Planning Commission and World Bank. Of the total enrolment in higher education, 38.5 per cent is in the state universities and colleges and only 2.6 per cent is in Central institutions, the remaining 58.9 per cent students being enrolled in private unaided universities and colleges. Even private enrolment is mostly in colleges affiliated to state universities, therefore states are the key stakeholders in higher education. This reality is recognized in the 12th Plan and state systems would get a lot of focus over the next five years. Key elements of the new approach and strategy, giving greater thrust to state higher education, would be discussed in session 4. For the complex, highly diverse and large system of higher education, there cannot be a uniform and standard agenda for reforms. Several states have taken initiatives and adopted innovative practices to improve their systems of higher education. Session 5 is for cross-learning from such practices. There will be representatives from state education departments who will present their case studies. A special CII-Planning Commission report titled ASHE 2012—Annual Status of Higher Education would be released by Secretary, MHRD, Mr Ashok Thakur. For the first time in India, CII and Planning Commission will be bringing out a comprehensive report which looks at higher education from state perspective since education is a concurrent subject in India and states are as responsible as the Centre in shaping and reforming it. The report will have a snapshot higher education view of every state. The Twelfth Five Year Plan has adopted a holistic approach to the aspects of expansion, equity and excellence. Expansion is not just accommodating ever larger number of students in higher education, but it is also about providing the expanded pool of students with choices of subjects, levels and institutions; at the same time ensuring a minimum level of academic quality. It is also highly crucial that access to higher education is ensured to all sections of society, irrespective of caste, creed, gender, region or religion. In the Twelfth Five Year Plan, there has been a shift in focus from planning at the institution level to planning at the state level. Due to the earlier approach of focusing at the institution level, even if optimal institution level outcome was achieved, the optimal state level goals were not. Due to this shift in focus, it is important for us to look at the State / UT as a unit, as opposed to institutions as a unit, and plan for the goals of expansion, equity and excellence accordingly. 2.Where do we aspire to be? 3.How do we achieve the set goals? The report, “ASHE – Annual Status of Higher Education in States and UTs 2012” - to be released during the “AICTE-CII University-Industry Congress & 4th Global Higher Education Summit” (8-9 Nov 2012) – is a sincere attempt to provide an answer in the direction of the first question – ‘Where are we now?’. The report provides data, facts and figures that would help the key stakeholders to move away from supply side centric planning and focus on a more holistic planning approach that considers supply-side and demand side perspectives. This report aims to be used by several stakeholders – Central and State agencies, State and local officials, business leaders, scholars and researchers and the general public – to formulate programs, apportion resources, monitor services, research issues and make informed decision. The key intent is to provide various stakeholders a system-level picture that will help them with a variety of aspects leading to decisions towards achieving improved expansion, equity and excellence in the respective State/ UT. §The expansion in higher education during the Eleventh Five Year Plan was led by the private sector, which currently accounts for nearly 60% of the total enrolment. The private sector will be encouraged to establish larger and higher quality institutions in the Twelfth Plan. §It has been proposed to re-examine the ‘not-for-profit’ status in higher education, so as to allow the entry of for-profit institutions in select areas, with the necessary vision to ensure quality and equity. §To provide private institutions access to long-term and low-interest rate debt by giving ‘infrastructure’ status to higher education. §To allow all types of institutions of higher education to be established under section 25 of the Companies Act. §To permit conversion of educational trusts and societies to Section 25 companies seamlessly. §To permit educational infrastructure companies to build and lease physical facilities to academic institutions with lease revenues subject to the same tax treatment as housing finance companies. §To permit educational trusts, societies and companies to raise funds from the capital market by issuing bonds and shares without changing their tax status. §To relax FCRA provisions for investments by NRIs in not-for-profit education. §To provide education companies tax exemptions in line with those enjoyed by IT companies. §Private institutions would benefit from various long-term quality enhancement efforts including enhanced use of technology and faculty development initiatives that are taken up during the Twelfth Plan. New models of Public Private Partnerships (PPP) in higher education will also be encouraged during the Twelfth Five Year Plan, particularly in the establishment of research and innovation institutions. Based on the Eleventh Plan experience of setting up Indian Institutes of Information Technology (IIITs) and polytechnics in PPP mode, a framework will be put in place to encourage the spread and growth of PPP models, increase and improve resource utilization and enhance the quality of education in such institutions.